Seen as one of our commonest and successful garden butterflies, the small Tortoiseshell is widespread, and may be seen across all parts of Britain and Ireland, often around patches of nettles or nectaring on wild flowers like, Dandelion, Thistles, Marjoram, Ragwort, and Buddleia in late summer. Usually seen from March through to October, the butterflies emerge from two broods in a year, the first is in June and the second, August to September, some of the adult butterflies from the later brood hibernate, appearing again on sunny days in early Spring. 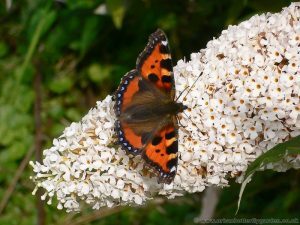 In the last few years, the pretty Small Tortoiseshell butterfly has unfortunately seen a massive decline in numbers, the cause of the falling numbers is not yet completely known, although changes in weather patterns are not being ruled out. 2013 was a good year for the small Tortoiseshell with a good number of sighting across the country. After a mild winter 2013-2014 it seems a good few made it through winter hibernation. I have seen more this March and April than in previous years at this time. Upper-wings: are a rich, orange with black spots on the front edge of the fore wings, Blue crescents sit in a Black margin around the fringes of the hind wings. Under-wings: are Dark Brown – Black. Caterpillars only feed on: Common Stinging Nettle (Urtica dioica). 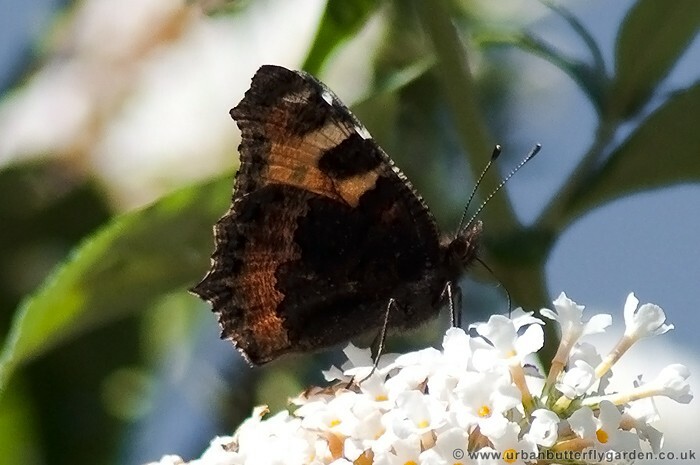 Photograph: Above – Small Tortoiseshell (Aglais urticae) feeding on White Buddleia (davidii) – August 09. Right – August 2010.